I have problem running this code. [5,13]: [ERR 102] Line 5:13 mismatched input '"frank"' in rule "RuleFlow-Split-interactiveJava-4-2-DROOLS_DEFAULT"
Exception in thread "main" java.lang.RuntimeException: Unable to compile "JavaInteractiveFlow.rf". You are using the wrong Type for the constraint. 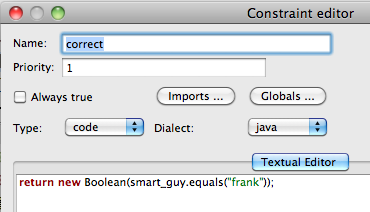 If you use Rule type, then the syntax of your constraint must be Drools DRL. I got it to works.